Juan Carlos "J.C." Romero (born June 4, 1976) is a Puerto Rican former professional baseball pitcher. He played in Major League Baseball (MLB) for the Minnesota Twins, Los Angeles Angels of Anaheim, Boston Red Sox, Baltimore Orioles, Philadelphia Phillies, Colorado Rockies, and the St. Louis Cardinals. Romero played college baseball at the University of Mobile. He was drafted by the Minnesota Twins in the 21st round of the 1997 Major League Baseball draft. 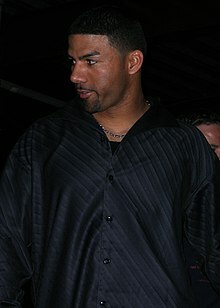 Romero was traded by the Twins to the Angels on December 9, 2005, for infielder Alexi Casilla. Romero was one of the Puerto Rican players to agree to play for Puerto Rico in the 2006 World Baseball Classic. On October 6, 2006, the Angels declined his contract option for 2007, making him a free agent. On December 15, he signed a 1-year deal with the Boston Red Sox. However, on June 9, 2007, he was designated for assignment, and then released on June 19, 2007. On June 23, 2007, Romero signed with the Philadelphia Phillies. During that season, Romero's ERA fell to just over 1.00. Romero improved a weak Phillies' bullpen plagued by inconsistency and injuries, which posted a 3.17 ERA in the final stretch of September. He also played a crucial role in the Phillies' triumph on the last day of the season, when in a 6–1 victory over the Nationals that capped the team's comeback against the New York Mets, Romero pitched one inning and struck out the side. Romero was named the Phillies' top reliever for the post-season. On November 10, 2007, Romero agreed to a multi-year deal to remain with the Phillies. On October 29, 2008, Romero was the winning pitcher in Game 5 of the World Series, which clinched the first major championship in the city of Philadelphia in 25 years. Along with his win in Game 3, he became the first Puerto Rican pitcher to win two games in one World Series. His club option for 2011 was declined by the Phillies after the 2010 season, but he agreed to return to the team by signing a one-year contract. He was designated for assignment on June 16 and was released on June 24. Prior to the 2009 season, Romero was suspended 50 games for testing positive for androstenedione, a performance-enhancing drug banned by MLB. Romero said that he bought a supplement named 6-OXO Extreme from a GNC store at the Cherry Hill Mall in Cherry Hill, New Jersey and that he was cleared to take it by two nutritionists. Romero actually tested positive on August 26, 2008, but he took the case to arbitration, allowing him to pitch in the postseason and World Series; after he stopped taking the supplement, he tested negative before the playoffs. Due to the suspension, Romero lost $1.25 million, so he is suing the makers of the supplement, Ergopharm Inc., along with The Vitamin Shoppe and GNC for his lost salary and punitive damages. Following the 50-game suspension, Romero returned to the Phillies' AAA affiliate, the Lehigh Valley IronPigs in May 2009. Romero returned to the Phillies on June 3, 2009. Romero signed a minor league contract with the Washington Nationals on June 29, 2011. On July 14, 2011, Romero was granted his release by the Nationals. He signed a minor league contract with the New York Yankees on July 14, 2011. He made 11 appearances for the Triple-A Scranton/Wilkes-Barre Yankees, facing 55 batters, striking out 10, and allowing four earned runs. He requested and was granted his release from the Yankees on August 8. On August 15, Romero signed a major league contract with the Colorado Rockies. On December 15, 2011, Romero signed a one-year contract with the St. Louis Cardinals. On May 14, 2012, Romero was released by the St. Louis Cardinals. On May 24, Romero signed a minor league contract with the Baltimore Orioles. He elected free agency on July 10. Romero signed a minor league contract with the Cleveland Indians on July 21, 2012, and was assigned to the Triple-A Columbus Clippers. On August 13, 2012 Romero was traded to the Baltimore Orioles for Triple-A infielder Carlos Rojas. On March 22, 2013, Romero signed a minor league contract with the Washington Nationals with an invitation to spring training. In 2015, after sitting out the 2014 season, he signed with the Pericos de Puebla of the Mexican League. Romero has appeared in three editions of the World Baseball Classic (2006, 2009, 2013) and is expected to play for Team Puerto Rico in the 2017 World Baseball Classic, despite his retirement. On July 9, 2017 J.C. was on the Phillies radio broadcast team doing color commentary. He also is now a pitching coach in Alabama. ^ "Sox sign J. C. Romero". The Boston Globe. December 15, 2006. ^ Dierkes, Tim. "Phillies Designate J. C. Romero For Assignment". MLBTradeRumors.com. Retrieved June 16, 2011. ^ Nicholson-Smith, Ben. "Phillies Release JC Romero". MLBTradeRumors.com. Retrieved June 24, 2011. ^ Gammons, Peter (January 6, 2009). "Suspended Romero 'didn't cheat'". ESPN.com. Retrieved May 4, 2009. ^ Salisbury, Jim (April 28, 2009). "Romero sues drug company". Philadelphia Inquirer. Archived from the original on May 3, 2009. Retrieved May 4, 2009. ^ Dierkes, Tim. "Nationals Sign J. C. Romero". MLBTradeRumors.com. Retrieved June 29, 2011. ^ Nicholson-Smith, Ben. "Nationals Release J. C. Romero". MLBTradeRumors.com. Retrieved July 14, 2011. ^ Nicholson-Smith, Ben. "Yankees Sign J. C. Romero". MLBTradeRumors.com. Retrieved July 14, 2011. ^ Nicholson-Smith, Ben. "Yankees Release J. C. Romero". MLBTradeRumors.com. Retrieved August 8, 2011. ^ Nicholson-Smith, Ben. "Rockies Designate Gonzalez, Sign Romero". MLBTradeRumors.com. Retrieved August 15, 2011. ^ "Nationals sign J. C. Romero to minor league deal – HardballTalk". hardballtalk.nbcsports.com. Retrieved January 12, 2014.